Subway has a couple of new sandwiches, although they appear to be in the testing phase. The sign in our store calls it the “Smoked Gouda Collection.” Both sandwiches are made with a Gouda spread. One is a Gouda Roast Beef and the other is a Gouda Club. These sandwiches are not shown on the Subway website. We asked the “sandwich artist” that made our fewd if Wichita is a test market for the sandwiches. She was not aware that these were not on the website. At the time of this writing, we have an email out to Subway to get the full story on when these will be available nationwide. We will update this review if we get an answer from Subway. UPDATE: We received a non-answer reply from Subway saying that different locations participate in different promotions, and that we should contact the local Subway to get an answer. We give up. We decided to test the Gouda Club. 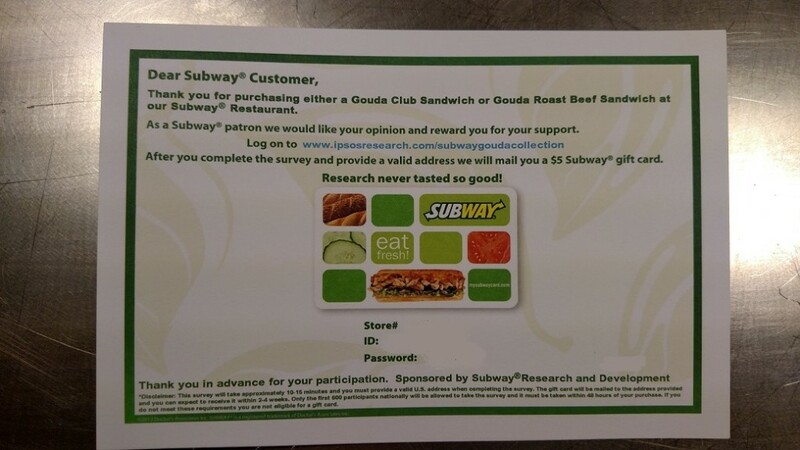 When we paid, the Subway employee gave us a post card since we ordered one of the new Gouda sandwiches. This further proved to us that we are a test market. You can see in the image that this is sponsored by Subway’s Research and Development department. Interestingly enough, we tried to fill out the survey and get our $5 Subway gift card, but the site came back and said that the survey is no longer available!! Nice job, Subway! Everybody knows that Subway sandwiches are always fully customized. 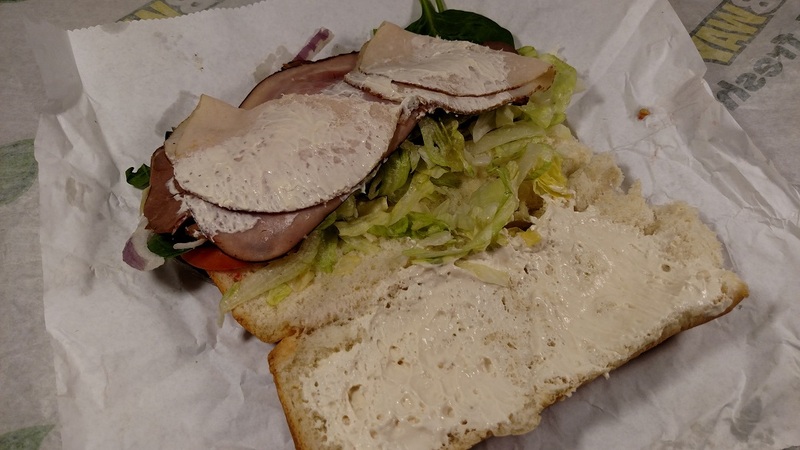 There never seems to be a “standard” way of making one of their advertised sandwiches. This is something that Denny has always found annoying. 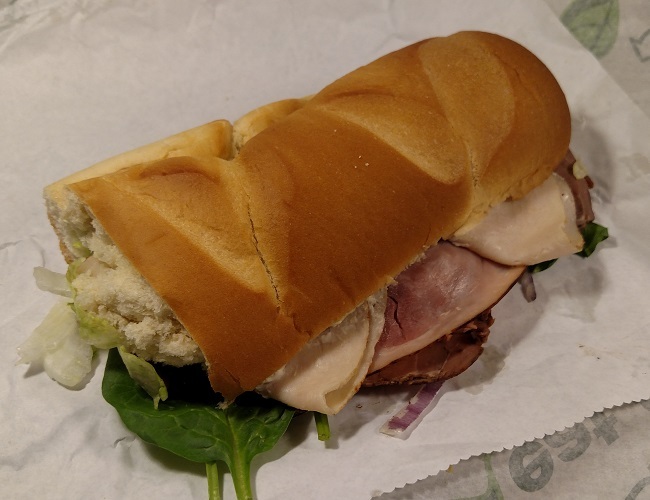 Why can’t a Subway eater ever just get the thing like it looks in the pictures?? Well for the first time, you can! Except that the “sandwich artist” still asked us what kind of bread we wanted, what vegetables, what sauces, and so on. We ordered it exactly like the menu shows it. Like pretty much all Subway sandwiches, there is very little meat. We ordered a six inch. There were two slices of turkey, two slices of ham, and two slices of roast beef. They are normal Subway slices, which are extremely small. The meat barely covers the bread. The vegetables were plenty, as is pretty standard. The bread was actually very good. We all know this isn’t always the case. We got lucky. The whole premise of these sandwiches is the Gouda. What strikes us most is that these are made with a Gouda spread, not actual slices of Gouda cheese. This even threw off our “sandwich artist.” She asked us what kind of cheese we wanted before realizing she would be using the spread. Thankfully, our artist put a pretty generous amount of the spread on the bread, and she actually spread it with a knife to make it cover the bread evenly. We doubt this will always be the case at every location. Again, we got lucky. In terms of taste, the meat has no distinguishable flavor. This is pretty much the case with all of Subway’s stuff. Whatever. We expected that. The real highlight here is the Gouda. And this is where it gets interesting. As long as your Subway puts enough of the spread on, you will taste it. It has a good flavor, but we just don’t know what that flavor is! Again, nothing screams Gouda. We think Subway went with this because people would recognize the name and try it. The combination of the vegetables on the menu board fit the sandwich well. This is something we would really like to see more of at Subway. Sometimes you don’t want to go through the hassle of picking out every freaking topping! You just want the damn sandwich that you see in the commercial! And in this case, the overall taste of everything suggested together makes a pretty damn good sandwich. Our biggest gripe is the price. What the hell happened to $5 footlongs?? Subway’s prices have soared out of control. Let’s face it…the meat and vegetables are not a very high quality. They certainly don’t warrant the prices. This SIX INCH set us back $5. The footlong is $8. That’s just for the sandwich, kids! Chips and a drink would take this way over ten bucks, and that is ridiculous. And don’t tell us it is because of the Gouda cheese, because it is a spread!! Overall, we liked the sandwich. 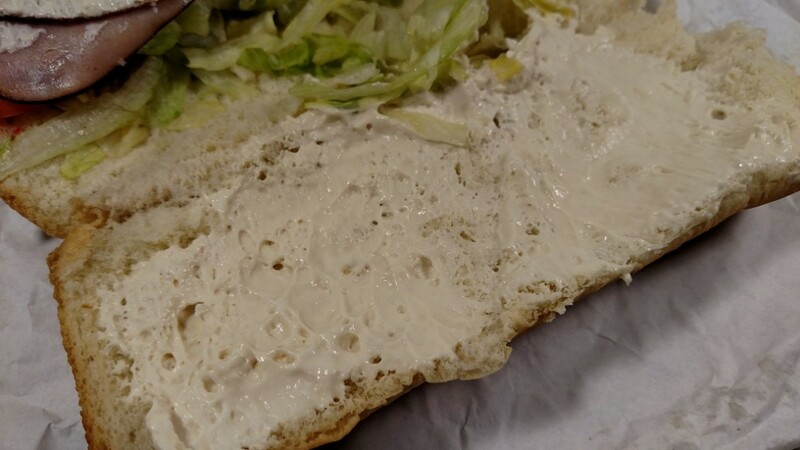 It is actually one of the best we have ever gotten at Subway. But if we wanted to spend 8 bucks on a pile of meat, cheese, and other ingredients wrapped up in something that is gimmicky and trendy, we’d go to Chipotle. But that’s a different review. When is this sub going to reach going Michigan?